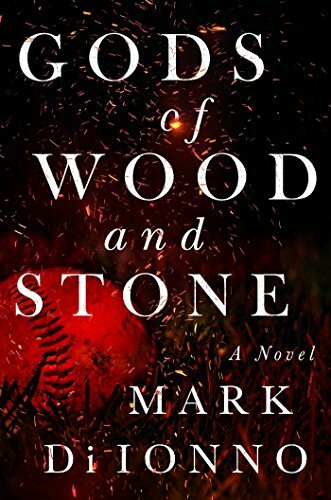 In the opening pages of the novel, Gods of Wood and Stone, Mark DiIonno describes an induction ceremony at the Baseball Hall of Fame in Cooperstown, New York. For those who follow baseball, this is a familiar annual ritual where the game’s greatest players are enshrined. On this particular day, there is only one player being honored, Joe Grudek of the Boston Red Sox. As Grudek begins his acceptance speech a large man carrying a sledge hammer reaches the podium and begins an attack on the Hall of Fame plaque honoring Grudek. When Grudek tries to stop the attack, he is no match for the attacker. It might be tempting to call Mark DiIonno’s second novel and fifth book a baseball novel. It is to some degree, but it is much more. As a journalist, travel writer, and historian, he brings a broad range of experience to his work. The two main characters, Joe Grudek and Horace Mueller, Cooperstown blacksmith and historian, do not know each other, have no personal connections, and yet their lives collide on this remarkable day at the Baseball Hall of Fame. The novel starts with this scene of mayhem and then tracks back through the lives of the two men following their different paths to this moment. The chapters go back and forth between these two lives. Those dealing with Joe Grudek present the portrait of a star athlete from New Jersey. There is some wonderful descriptive writing on Grudek’s early life in urban New Jersey. His baseball career is narrated quite well, and the culture of the locker room gets considerable exposure. Grudek’s privileged life as a star athlete is detailed from his early years through his adjustment to retirement, and election to the Hall of Fame. Along the way it, becomes clear that Grudek is unhappy, has almost no friends, and has developed a distaste for baseball fans, press, executives, marketing, and nearly everything else connected to the new commodified game of recent times. At one level, he can be seen as an ingrate, at another a tragic figure ground up by the massive commercial sports culture which is eating at him. Horace Mueller is likewise alienated from modern American society. A rural character from a simpler time, Horace refuses to come to terms with modern culture. He detests the electronic revolution and the demeaning commercialism he sees engulfing him and his family. He has retreated to the 19th century, becomes detached from his wife, and, although wanting to be a good father, cannot connect with his teenage son. The two main characters are quite different from one another in lifestyle and values, but share a strong dislike for contemporary society. Some of DiNonno’s strongest writing is in the indictments of modern American life, including its obsession with sports. Both Joe and Horace share similar but slightly different views on masculinity, with physicality a significant masculine marker. Joe’s masculinity is expressed sexually, particularly in the free access to women that his athleticism and celebrity offers to him. Horace finds his masculinity in his role as father and head of household, neither of which he performs all that well, but his values are solid. Both men are homophobic. One of the great strengths of the novel is DiIonno’s eye for the physical world of New Jersey and upstate New York, both past and present. He uses his familiarity with these urban and rural landscapes, as well as his knowledge of local history, to create a complex and, in many ways, loving portrait of this world. If there is a weakness in the writing, it is a tendency to overkill and overwrite and, in the process, test the patience of readers. Some of the minor characters are weak and clichéd, and some of the subplots are predictable and unnecessary. That being said, the main characters, the depiction of their lives, and the attention to setting and detail makes Gods of Wood and Stone a very strong novel and powerful critique of contemporary life and culture. Richard Crepeau is a staff writer at New York Journal of Books.